They are like little paintings. Each year new artists make beautiful designs. I love them at the beach and also in the house. Pareos can cover a chair; Scarfs can be sewn together to make cushions or framed like a photo. When I get to a new hotel room, I nest. Part of nesting for me is to un-pack and throw Hermes scarfs on top of the lamps. It gives a pretty soft light as long as the bulb isn’t too strong. I haven’t set any rooms on fire yet! Marine Dupre is my 19 year old niece who lives in Paris and came to Palma de Mallorca for a visit while she waits to hear if she got her baccalaureate before taking off for more vacations if she passes. Fingers crossed! Her summer bag is a pretty blue Goyard with a bright orange stripe. She fills it up with many little pouches witch is very useful when it flips over on the beach. It doesn’t mind the sand or the water, fits everything from your ipad to your beach towel, is really easy to carry, light and looks very stylish. It should be the summer must-have accessory. Just arrived in Palma. 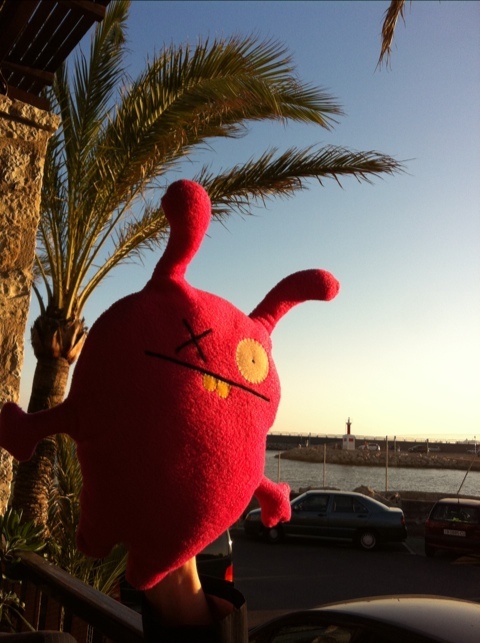 The ugly doll came with me. Just need to find her a bathing suit. Shooting Outside Makes You Meet New Friends. North of LA has beautiful ranches. We shot the Jessica Simpson campaign on one of them. We had to fight lots of bugs and goats. They seemed to really enjoy our company. Jessica is a high heels super pro. I wasn’t paying too much attention until I tried a pair. There is a little cushion right where it usually hurts after few hours on my feet. They make you really tall and should still leave you with enough money to buy something else. Theses are coming out in July: Jessica Simpson Collection. Windbreakers, dresses that look like wetsuits, totally watersport inspired…. Maybe something to do with his new line of bathing suit? Flats or high heels. Night or day. Very versatile. Have to love it. You are currently viewing the archives for June, 2011 at Blog by Isabel Dupré.